Well I hope you're all having a terrific holiday! Thanks so much for taking the time to stop in today. I have some exciting news...the blog turned 2 over the weekend! I honestly can't believe that I've been doing this for two years, the time has flown by since I hit "Publish" on that first post. I never would have believed how this venture has changed my life, given me so many new friends, and is giving me opportunities I never would have imagined! So, to celebrate, how about a week full of giveaways...just from me to you. I went shopping and found some things that I couldn't resist, and I thought you might like them too! All just for you...to THANK YOU for a wonderful 2 years! Each day this week I'll have a little something to send along, so stop by often and check in. Alright, up first, one of my favorite things. Well, two of my favorite things, kind-of combined. A leopard clutch! This is the perfect bag to add a spark of fun to anything from a formal occasion to a casual date night outfit! To enter, just leave a comment on this post. I know some of my readers have difficulty commenting here, so feel free to hop over to my Facebook Page and leave a comment there, I'll count those too. *Sorry, but my budget can only allow shipping to the Continental U.S., so only those living here are eligible to win. For a bonus entry, subscribe to follow my blog any way you choose, by RSS feed, Google Friend Connect, e-mail, Bloglovin' or Facebook. You can find those options over to the right in my sidebar. Just leave an extra comment telling me which one of those ways you are following. For one more bonus entry, pin this giveaway photo and leave a comment telling me you did. This giveaway will close Tuesday (9-3-13) evening at midnight, Central time. Happy 2 years! That's an awesome accomplishment! PS- I follow you on BlogLoving! And my google account is through my school, so it forces me to have Mrs. Hitt. Congrats and Happy Blogiversary! Great giveaway! I follow you on bloglovin ! Congratulations on 2 years, my friend!! So glad you hit that publish button way back when and I've come to know you through blogging! Thanks for bringing so much creativity and fun to the internet! Congrats on your second anniversary of your blog. Continued successes in your upcoming years. 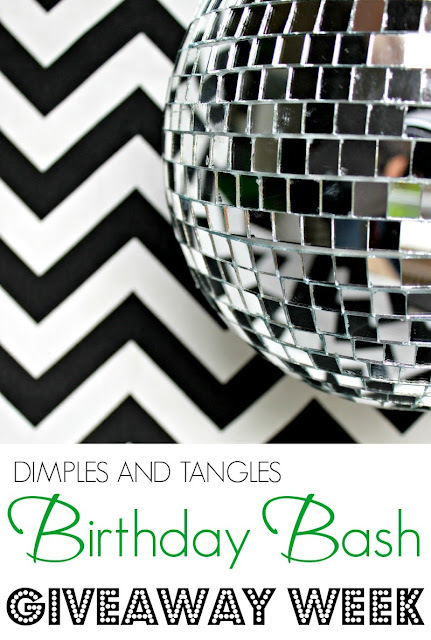 I follow Dimples and Tangles via bloglovin. I am so happy I found your blog- I love all of your projects and just all around sweetness! Happy Anniversary. I'm almost to 2 years, too, and I agree, it has changed my life. Happpy celebration!! I'm a very happy follower on GFC. Congratulations on your two years - what an accomplishment! I just found your blog through Worthing Court, where she shared so many beautiful spaces in your home. I am your newest follower on GFC. Happy Anniversary, Jennifer! I'm always inspired by you and so appreciate the support you've given me! :) Can't wait to see all the awesomeness you create this year! Happy Birthday!! You've accomplished so much in 2 short years!! Happy 2 year anniversary, Jennifer! So thankful I found your blog, I check in with you daily! I also pinned your contest! Hope I'm the luckiest one! Love the purse! Happy Anniversary!!!! I subscribe via email, like on FB and i pinned the contest. Thank you for all the great inspiration. Congrats on 2 years! Time sure does fly by so quickly...doesn't it? I just love your blog. Here's to many more. 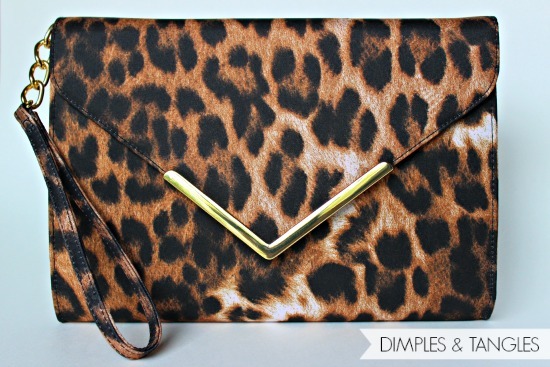 Oh, clutches and leopard are two of my favorite things, too!! What a great giveaway! Congratulations on your 2 years! Happy two years to you, Jennifer! 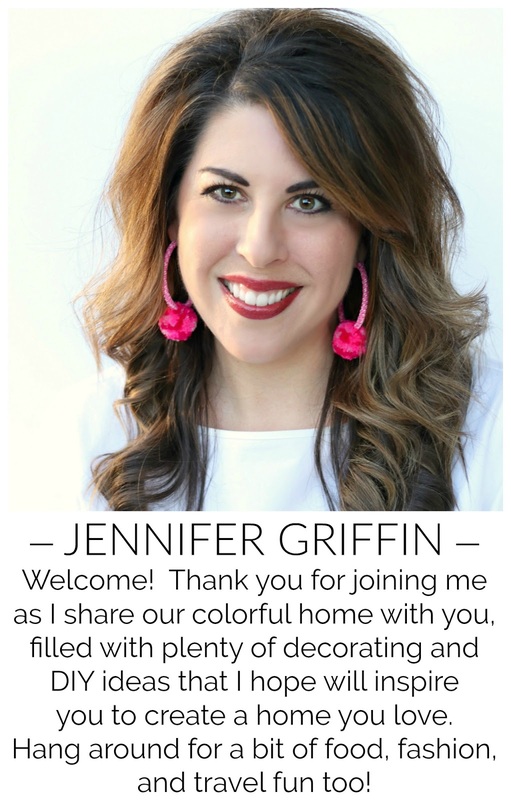 Love your blog, and gracious style! Oh how fabulous. I want it, LOL! Also happy 2 year anniversary. This bag has my name all over it! Thanks for the opportunity to win. Happy Blogoversary! I follow by GFC, Bloglovin, FB and email! Two Years!.. I bet the time has really flown by, too. I really love your decorating..so new and refreshing and fun! Your home is just beautiful and so is your spirit. I really love the leopard print purse...just picked up two tops that would go so well with it...I follow you via email. Congratulations! Love checking in on Dimples and Tangles! Congrats on your second year of blogging! Love your style! I follow through Bloglovin and on Facebook! I pinned about the contest! Would so love to win! Congrats! 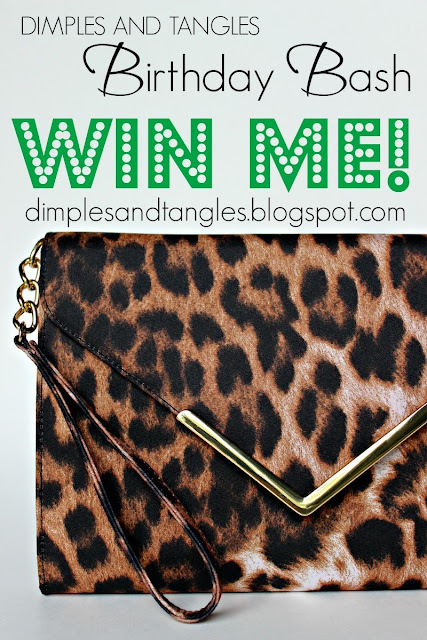 Love a leopard print clutch! Congratulations! I follow by email, and I love, love, love your blog! 2 of my favorite things...leopard and purses! Would ADORE this!! Following you on Bloglovin as bdimassi. Congrats on so much success in your first two years! Happy Birthday and congrats on your 2yrs. Happy Anniversary! Your blog is on my daily "check list". 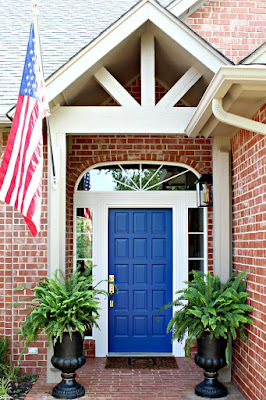 Love your bold color choices in your home-they inspire me to consider pops of color instead of one more safe neutral. Thanks for sharing! what a great looking accessory! i just liked you on fb, too. I subscribe to your daily emails and so glad I do. I pinned your contest pic for a bonus entry! Congratulations! Always love checking out your new posts! This is adorable! Congrats on hitting 2! !